notes regarding operating your monitor. use it for an extensive period of time. connecting and using your computer monitor. cloth as soon as possible. send it to the maintenance center. the power plug and outlet are easily accessible. or DC power cord for normal operation. conventions used in this document. hardware or loss of data. and tells you how to avoid the problem. mandated by the relevant regulatory authority. scratching or damaging the screen. column until the latch locks the base. secure the base to the column tightly. your monitor into a nearby outlet. Return to previous OSD level. Change the signal input source. around the different adjustments later on. 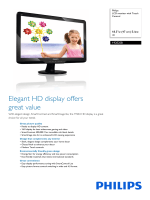 HD videos come to life with full digital sound. different than a standard HDMI cable. How do I use the MHL function? cable in order to use this function. [MHL-HDMI] marked port on the monitor side. 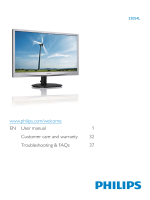 delivers great optimized monitor performance. How to enable SmartImage Lite? click the shortcut on desktop or toolbar. of images on dark backgrounds. viewing comfort for every type of content. to Wizard for first time launch. wizard later on as well. adjustments, RGB White point adjustment, etc. Contrast, Focus, Position and Resolution. 1. "Show Me" starts color calibration tutorial. 3. Quick View loads the before/after images. 5. Enable color calibration - by default is on. 6. Must have patent info in calibration screen. вЂў Displays current preference settings. вЂў Final next goes File>Presets pane. check box is a toggle. tray icon will only display EXIT. вЂў Run at Startup is checked (On) by default. Vista, XP). Default is 0% Opaque. CI, only the Help and Options tabs are available. the menu will be visible. against the most current available. вЂў Exit - Close SmartControl Lite. 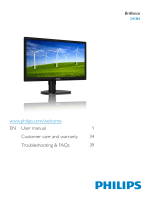 SmartControl Lite from Program menu, doubleclick the desktop PC icon or restart the system. menu of saved presets for immediate use. folder, only the EXIT selection is available. task tray. Left Click will launch the application. This data is subject to change without notice. вЂў 2009/125/EC (ErP Directive, EC No. вЂў GS EK1-2000:2011 (GS mark requirement). que celui utilisГ© par le rГ©cepteur. DU STГ„LLER DIN UTRUSTNING PГ…PLATS. III В¤ 5 Abs. 4 der RГ¶ntgenverordnung erfГјllt sind. STГ�MTILFГ�RSEL ER LETTE Г… NГ…. geringem Zeichenkontrast wГ¤ren die Folge). вЂў Make sure the computer is turned on. becomes un-usable, what do I do? 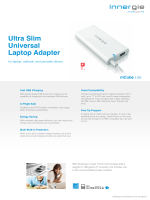 Lite to ensure proper driver is installed. anymore, what can I do? the monitor driver may need to be reinstalled. under Monitor, then you need to re-install. failure message shows, what happened? Lite, and re-install it once more. the graphic adaptor is not supported. which fully supporting DDC/CI interface. Function. What can I do? charge after verification of ownership. covered by standard warranty terms. CD-ROM) included in this package. Q4:How do I adjust the resolution? Panel with the "Display properties". Q6:Is the LCD screen resistant to scratches? force applied to the panel surface side. This may affect your warranty conditions. Q7:How should I clean the LCD surface? 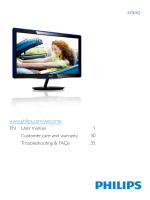 Q10: Are Philips LCD monitors Plug-andPlay? 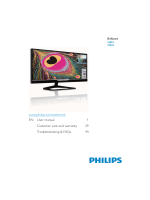 Severe"burn-in" or "after-image" or "ghost image"
monitor complies with this standard. text, and is displaying jagged characters? For best display, please use this resolution. cable to connect the devices. вЂў The product is officially MHL-certified. manufacturer of the mobile device. 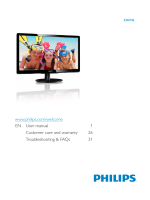 В© 2013 Koninklijke Philips Electronics N.V. All rights reserved.